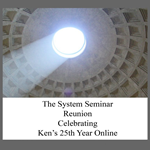 System Secrets, the book, is a collection of lessons from Ken's popular Pre-System seminar series. It covers topics like how to find hot markets...what to sell on the Internet...how to write killer copy...how to get traffic to your website...how to avoid common marketing mistakes...the eight fundamental principles of The System...and how to achieve anything you want including success online. A very rare two-day training by the creator and founder of the System Seminar, Ken McCarthy. This is not another "me too" copywriting course made up of bits and pieces of commonly circulated advice. It's about what it really takes to build a solid, seven figure a year income as an info marketer by someone who has done it. Blunt, truthful, and original. There's nothing else like it. The Reunion was everything I hoped for and more. We kept it small and we didn't hype it so we got a lot of serious veterans. Folks with 10, 15, even 20+ years of online marketing experience. This let us cover a lot of serious ground in a short period of time.